Two distant planets collided head-on to create an iron-rich world with nearly 10 times the mass of Earth, astronomers believe. The cosmic crash is the first interplanetary impact to be detected outside the solar system. 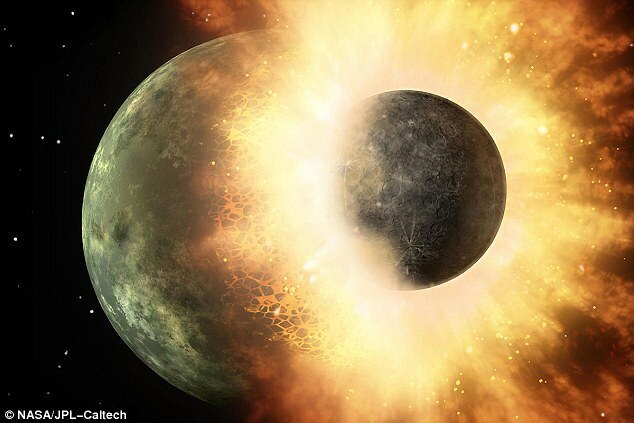 A similar collision between Earth and a Mars-sized object led to the formation of the moon 4.5 billion years ago, manpy experts believe. The new discovery was made by an international team of astronomers in the Canary Islands observing a star system with four planets more than 1,600 light years away. One of the planets, called Kepler-107c, had an unusually high mass in relation to its size. This suggested that it may once have been larger, but a high-speed collision with another planet stripped off its outer layer, or mantle. What was left was a large iron core making up 70 per cent of its mass. A neighbouring planet in the system, Kepler-107b, was about the same size but twice as light. Its iron core accounted for 30 per cent of its mass. The scientists calculated that the colliding planets must have been travelling at more than 37 miles (60 km) per second at the time of impact.